Eyrie tells the story of Keely, a washed up, middle-aged man who is self-medicating with alcohol and prescription drugs. The book is set in Fremantle, Western Australia, and the eyrie is Keely’s tenth floor flat of the Mirador building, where the book begins. The opening is outstanding, as Keely stumbles about in the midst of the mother of all hangovers, trying to work out what the giant stain is on his carpet. It is both comic and tragic, and so rich in description that you can almost taste the bile in his stomach. The reader quickly realises that Keely is an unreliable witness. He is not only a drunk, but his history is peppered with forgotten conversations and events and his present with confused, waking dreams. There is a story in itself in Keely, but Winton doesn’t allow Keely to remember, recall or even explore much of his past. His fog is the present. The story then isn’t Keely’s but about a girl from his past, Gemma Buck (a girl rescued by his heroic parents when Keely was a boy) and her grandson, Kai. Keely gets sucked in to their life, and the soundtrack of drugs and violence. 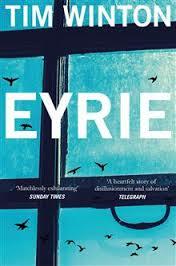 The story of Eyrie is in the attachment between the man and the boy, both lost souls, both damaged in their own way. It is gritty, dark and at times very bleak. I loved many things about Eyrie, and yet it frustrated me too. I’m not afraid of a book that makes you think, and there are many things to get lost in thought about. There are big themes – family, addiction, domestic abuse, violence, child development, justice, heroes, love – and these crash about the novel. The frustrations were equally big – wanting to get under the skin of Keely, wanting his past explained more (not merely hinted at) – but the biggest of all was the ending. I had to re-read the last scene to work out what actually had happened, and I am still not sure. It gave no real closure to the story of Keely, Gemma or Kai, and this left me unsatisfied as a reader. I adore Winton’s writing. His prose is so dense that it’s sticky, and this is unfailing page after page. There is great tension throughout the book; the pace is relentless in an absolutely crazy way. The dialogue is excellent, bringing dark humour to brighten the shadows of the novel. The metaphor running throughout the book, the birds of prey, is wonderfully woven. I think that Eyrie is a book about questions, not answers. With that in mind, I think it frames it better for a reading experience. Do I recommend it? Yes, for the writing masterclass. If you like every thread neatly sewn up, then step away. Am I glad that I read it? Oh hell yes!